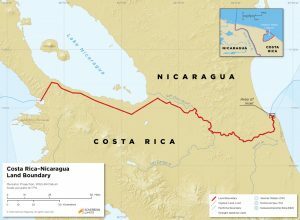 The land boundary between Costa Rica and Nicaragua has been disputed intermittently from its inception in 1858 through the present. The majority of the three hundred kilometer border was demarcated and remains undisputed. However, the location of the land boundary terminus in the Caribbean on Isla Portillos came into question in 2010 and was finally resolved by the International Court of Justice in 2018 in a joint land-maritime boundary Judgment.